Man!, what a team these two guys make!! Messi and Tevez have not played for long in this World Cup, but the little amount of time that they have been on the field, they have been pretty electrifying!! I love the way these two team up. 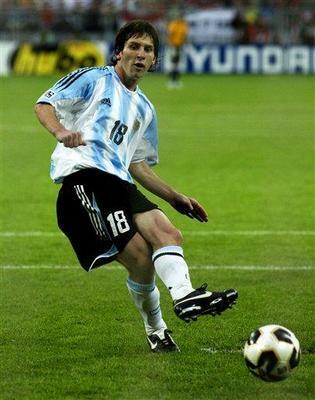 Messi has great dribbling skills and takes every oppurtunity to show em off!! 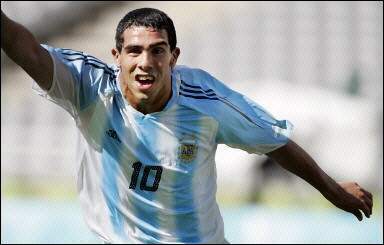 Tevez is more powerfully built and more of a hit-and-run-bomber kinda player. Both are very effective!! Poetry in motion is what I would say of these two. Man, I am really looking forward to the match tomorrow between Argentina and Germany. Both have been playing really good games. Germany seems a little stronger, but I am certain that Argentina will make it through. Germany makes really fast breaks and finishes them with gusto, but Argentina, though faster than most south american teams, still builds up their attack slowly. The thing that I love is the part that the playmaker that Argentina always has. It is something of a trademark in their games. In the 1998 World Cup, it was another awesome player, Ariel Ortega. Ortega is an awesome player. But kinda temperamental. He lost his cool in the 1998 World Cup, headbutting Van Der Sar and getting a red card for that. This time, the playmaker for Argentina is Riquelme. He is one cool customer and never loses his cool even when surrounded from all angles. I am certain he will have a great part to play in the match tomorrow.